Traditional Spanish house with swimming pool and near seashore. 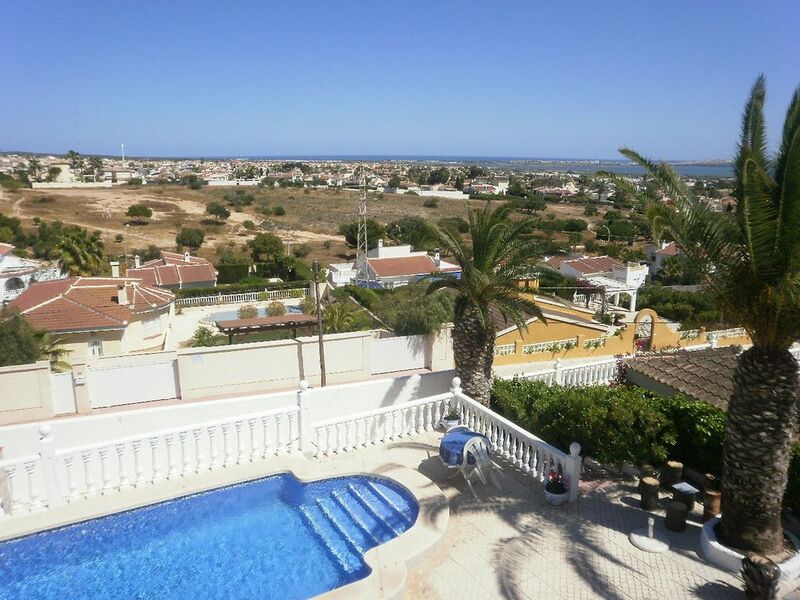 This traditional Spanish house named Villa Falkenburg holds a 110 sq m living space and a large covered porch overlooking the vacation town of Ciudad Quesada and the clean beaches of the Costa Blanca. The mansion is encircled by a beautiful 1000 sq m garden with orange and lemon trees, oleander bushes surrounding the spacious swimming pool and several outgrown palm trees. The villa also boasts a neat fireplace in the living room as well an Barbecue in the garden and a large garage in case of a rental car. There are also some other properties available in the area with private swimming pools, while several golf courses are near by. If you decide to book this property, please DO NOT wire the funds via HomeAway's website!!! Contact the property owner directly. See Holiday-Rentals travel offers for discounts on car rental. All laundry will you get from us, towels kitchen and beds. From the Villa about fivehundert mtr. are an new fitnessroom. Villa Falkenburg where we spent our last vacation we like it very much. The beautiful view from the villa, all over Qeusada was an experience for us. The house clean, comfortable practically furnished. There was nothing missing. The weather in February was blinding. Temperatures of 20 degrees and more. It is like being at home, you have everything you need in the villa, as it was very well equipped, beds comfortable, but downside is it has tv but no English channels only news which kept breaking up. Double garage for car safety which is very handy especially in the summer when it is very hot, it helps to keep the car cool. The villa stands on a hill, so the villa has a wonderful view of the sea and Qeusada. also from the private pool the view is very nice. the garden is well maintained and relaxing. Even for older people who are good on foot, the stairs are a training for the condition. For the winter time the television is important this was renewed. SUPER maison Conforme au descriptif une vue formidable et un dépaysement total,La piscine est superbe. We found Villa Falkenburg via a letting site and stayed the first 2 weeks of June 2014, after making contact with the owners who have been very kind all the way through enough confidence was there to make the booking although there were no reviews posted. It helped that we have been staying close by for many years and have walked past it dozens and dozens of times so it was an easy choice to make. Situated in Quesdada and very close (10 to 15 minutes’ walk) to the centre made it an ideal location for us.. A particular issue was we were taking our 10 month old grandson on his first holiday abroad so comfort and a private pool were high on our checklist. What was not highlighted against the villa letting site was a cot however the owners provided one at our first request at no extra cost which was a burden removed. The Villa itself is not your typical holiday letting and has clearly been someone’s home, it is very well furnished and decorated but above all clean, it has the best equipped kitchen in any holiday let we have stayed in and without doubt is the most comfortable and a joy to return to after a day out. There is no air conditioning but this was not an issue as there are plenty of fans and lots of operable windows with screens so the heat was never an issue and nor would I expect it to be in the height of the summer. There is a double garage with access direct off the road which was a godsend not from a security point of view necessarily but the car was guaranteed to be cool when we jumped in to trot down the shops (a car is not essential here). There area number of steps up to the property which is why the views are so great so not suitable for those with mobility issues. Otherwise this wonderful home is suitable for all, the young and us oldies alike.What really makes this villa is the outside space, the BBQ like the kitchen very well equipped; the pool was beautiful we swam from 8 in the morning until 8 at night with the sun on the water all through the day until around 6. I seem to think the the filtration system is salt based so definitely no chlorine in the eyes.The numerous well established palm trees gave welcome shade through the day when you needed it and a great deal of privacy exists from the neighbours either side which are some distance away. We thoroughly enjoyed our stay here and will return soon – this Villa receives our highest recommendation and will be happy to answer genuine requests for information. Excellent value. Golf: Villa Falkenburg is located in close range to several golf courses. The 'home course' and closest to the mansion (1 mile) is the Golf and Country Club Marquesa. The course is easy to play and ideal to prepare for the tougher courses ahead. Real Club de Golf de Campoamor and Campo de Golf Villamartin fit more the average golfer, whereas Club de Golf Las Ramblas is a special golf course and requires a good short-game. All of the three courses are about 8 miles from the house away.